This game-related drill will improve your player’s adaptation and orientation skills. Coordination abilities such as rhythmization, adaptability, orientation and a combinatory ability are deciding factors in modern soccer. The drill will allow you to improve these skills and help you to complete your game. Presented by FC Bayern Munich (women) assistant coach Thorsten Zaunmüller. Determine a starting point where one player is in possession of the ball and ready to go. About 10 meters away from that starting point there’s another player waiting for the ball. To her left and to her right there are different colored cones. Three or four players are positioned around 20 meters away from player 2. Behind them, there are three mini goals. Player 1 shouts out a color. Player 2 now has to move towards that color, where she receives a pass. She then turns around and passes it to one of the three or four players who scores into a mini goal. You can also include colored jerseys for the strikers, so that player 2 has to match cone and jersey. You can also include defenders to make the drill even more game-related. Create innovative training session specifically designed for female soccer players. Make your players better with drills focused on coordination, adaptability, and rhythmization. 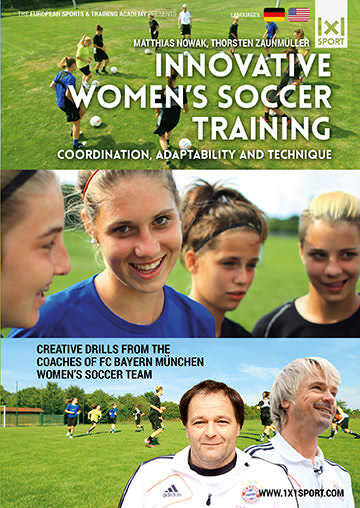 Developed by the coaches of FC Bayern Munich Women's team.